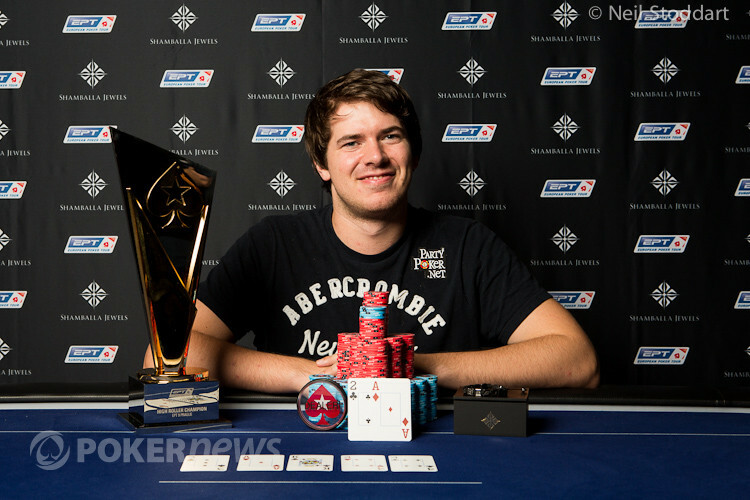 Marvin Rettenmaier wins the €10,000 High Roller at EPT Prague. The Season 9 European Poker Tour Prague €10,000 High Roller shattered expectations when it drew 113 entries and created a prize pool of €1,107,400. The field was so impressive that it an extra day had to be added to the schedule to determine a winner. That man was Marvin Rettenmaier, who captured the €365,300 first-place prize and earned the title of EPT9 Prague High Roller champion. The final nine players returned to the Prague Hilton on Saturday to play to a winner, and it didn’t take long for one to be determined; in fact, four players hit the rail in the first level of play (Level 22 12,000/24,000/3,000). The first to go was France’s Aubin Cazals, who began the day on the short stack. His demise came when he moved all in from the cutoff for 240,000 and Finland's Juha Helppi moved all in over the top from the small blind. The big folded and Helppi tabled , which had Cazals' dominated. Helppi's kicker has him as a heavy favorite; in fact, the PokerNews Odd Calculator had him as a 71.54% favorite; meanwhile, Cazals had just a 22.74% chance of surviving the hand. That actually dropped to a measly 4.84% on the flop, and hit zero on the turn. Cazals began to rise even before the hit the turn on the river, and he exited in ninth place. Not long after, a short-stacked Andrey Gulyy moved all in under the gun for 357,000 and received a call from Helppi in the cutoff. Gulyy had ran into a pair of kings, which meant his best chance of winning was to catch an ace. The flop paired his jack, meaning he could win with another, but it was not meant to be as the blanked on the turn followed by the on the river. The towering Russian was eliminated in eighth place for €33,200. Just a couple of hands later, Team PokerStars Pro Jason Mercier followed Gulyy out the door after Helppi raised to 48,000 from middle position and Mercier three-bet jammed for around 350,000. Action folded back to Helppi and he snap-called. Once again Helppi held a big hand, and he had Mercier in dire straights. The flop gave Mercier a pair of queens, but it also delivered Helppi a pair of aces. The turn was of no consequence, and neither was the river. With that, the last Team PokerStars Pro in the field made his way to the payout desk in seventh place to collect €44,200. In the very next hand, action folded to Marcin Wydrowski in the small blind and he splashed in a bunch of chips for a raise to 210,000; however, since he only had 90,000 or so behind it essentially represented a shove. Germany's Marvin Rettenmaier then squeezed out his cards in the big blind, moved all in, and Wydrowski committed his remaining chips. Wydrowski got it in good, but that wouldn't matter as the flop hit Rettenmaier hard with trips. Wydrowski remained seated until the dealer burned and turned the , which left him drawing dead. The was run out on the river for good measure and Wydrowski exited the tournament in sixth place. Soon after the Level 23 began with the blinds at 15,000/30,000 and a 4,000 ante, start-of-the-day chip leader Sorel Mizzi opened to 60,000 in first position, Fabian Quoss three-bet to 100,000 on his direct left, and the action folded back to Mizzi, who called. The dealer fanned , and Mizzi checked. Quoss continued, tossing out four red T25,000 chips, and Mizzi went into the tank before moving all in for 470,000 total. "Call," Quoss said immediately, turning over . Mizzi was very much alive with , and the on the turn gave him two extra outs to make a better full house. The river was red, but the was a brick, and Mizzi was eliminated in fifth place for €74,800. It took awhile for the next elimination to occur, but it came in Level 24 (20,000/40,000/5,000) when France’s Philippe Ktorza open-jammed for 450,000 on the button, Quoss called in the small blind, and Rettenmaier re-shipped from the big blind. Quoss checked his cards one last time, then folded. The flop fell , prompting Quoss to say, "Guess what I folded?" 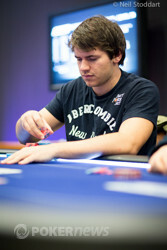 The turn and river came , respectively, and Ktorza was eliminated in fourth place for €96,600. Rettenmaier turned his attention to Quoss, who said, "Quads." One level later (Level 25; 25,000/50,000/5,000), Quoss opened to 100,000 on the button, Helppi three-bet to 280,000 from the big blind, and Quoss called. The flop fell , Helppi led out for 200,000, and Quoss tank-called. The turn was the , and after a bit of thought, Helppi moved all in for effectively 985,000. Quoss checked his cards one last time, then called. The hit the river, Quoss' two pair held, and Helppi was crippled down to 235,000 chips. Two hands later, he open-shoved on the button and Rettenmaier called in the big blind. Helppi had him crushed, but the board ran out , giving Rettenmaier a winning king-jack flush. With that, the Finn exited in third place and left the two Germans essentially even in chips. The heads-up battle was an extended affair, lasting over two hours, but eventually Rettenmaier was able to wear down Quoss and pull out to a more than 4-1 chip lead before finishing the job. We'll have a full recap of the day's action for you shortly, so stay tuned. It was a prolonged heads-up match, but we finally have a winner. After Fabian Quoss opened for 160,000 on the button, Marvin Rettenmaier thought for about 20 seconds before announcing that he was all in. Quoss called off for right around 1.25 million and the cards were turned up. Rettenmaier was good, and the action was paused so the tournament director could announce the action to the tournament room. When the dealer finally burned and put out the flop, a king was in the window, though it was followed by an ace... .
Rettenmaier maintained the lead, but the turn made things interesting as his German companion had picked up a flush draw. The dealer burned one last time and put out the . 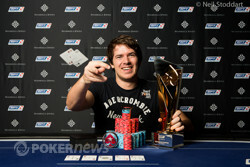 Quoss missed all his outs and finished as runner-up of the EPT9 Prague High Roller. Fabian Quoss limped in on the button, Marvin Rettenmaier raised to 265,000, and Quoss called. The flop fell , Rettenmaier led out for 215,000, and Quoss called. The turn was the , Rettenmaier checked, and Quoss slid out 450,000. Rettenmaier went into the tank, and then announced all in. Before the dealer could even toss the "all-in triangle" in front of Rettenmaier, Quoss folded his hand. Marvin Rettenmaier opened for 165,000, Fabian Quoss defended, and the flop came down . Both players checked, and then Rettenmaier called a bet of 200,000 on the turn before both players returned to checking on the river. Quoss rolled over and it was good as Rettenmaier mucked. Marvin Rettenmaier had the button, and raised to 165,000. 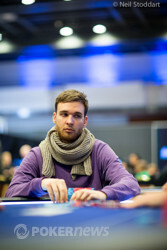 Fabian Quoss three-bet to 450,000, Rettenmaier moved all in, and Quoss snap-folded. A few hands later, Quoss limped in on the button, and Rettenmaier raised to 260,000. Quoss called. The flop fell , and Rettenmaier led out for 210,000. Quoss tank-called. The turn was the , both players checked, and the completed the board. Rettenmaier checked again, and Quoss fired 350,000. Rettenmaier tanked for the better part of three minutes, then check-raised to 990,000. Quoss folded fairly quickly, and Rettenmaier offered to show his hand to his friend. Quoss declined. Fabian Quoss limped the button and Marvin Rettenmaier checked his option from the big blind. The flop saw Rettenmaier lead out for 85,000, Quoss call, and the both players check the turn. Rettenmaier checked again on the river, but this time Quoss came out with a huge bet of 600,000. Rettenmaier gave it about five seconds worth of thought before folding. Can Team PokerStars Pro Jason Mercier Overcome A Bad Beat And Conquer A Stacked Final Table?